Frequently asked questions about the benchmarks for Year 7 and 8 students. Schools are required under the National Administration Guidelines to provide career education from Year 7. The benchmarks provide a common understanding of what effective practice in career education and development requires. The benchmarks are a tool for schools to identify their strengths and weaknesses and improve their practice. They place young people at the centre, and identify the career management competencies that Year 8 students need to develop. In 2011 we developed benchmarks for secondary schools, and in 2012 we developed benchmarks for tertiary organisations. The benchmarks will be regularly reviewed and updated to ensure they remain relevant and useful. Careers New Zealand set up a project team to develop and test the benchmarks, which was guided by an external reference group made up of members from the Year 7 and 8 sector, and peer-reviewed by career experts. This group met twice to review the project and examine drafts and feedback received from testing. Members of the external reference group also assisted with consulting other members of their organisations, and helped those doing testing. Once the external reference group approved the first draft, the benchmarks were field tested throughout the country in a range of schools with Year 7 and 8 students (47 schools with a mix of full primary, intermediate, Year 7-13, rural, urban, large, small, Māori and English medium). The document was also made publicly available so any interested party could make a submission. The benchmarks are based on New Zealand and international research and findings on effective practice in career development. They contain a full reference list and bibliography. Careers New Zealand seconded Odie Johnson as the lead writer. The project team consisted of Dale Bailey, Julie Thomas, project executives, Mitch de Vries. project manager, and Dion Crouch, Jackie Fowke and Kim Gray, team members. Career Development Association of New Zealand. Two career experts, Dr Heather Carpenter (NZ) and Dr Mary McMahon (Australia), also peer-reviewed the document. The review process integrated thinking from key Ministry of Education strategies, which are an intrinsic part of the benchmarks model. Where do the student career management competencies fit with the key competencies? The student career management competencies support and expand on the key competencies of the New Zealand Curriculum. They provide a specific context and specific detail of the competencies required for successful transition to secondary school. They are a core part of the curriculum, not an addition. The benchmarks are aspirational. Consolidating effectiveness and highly effective levels indicate what best practice looks like. The highly effective column is designed to be a reach for schools. 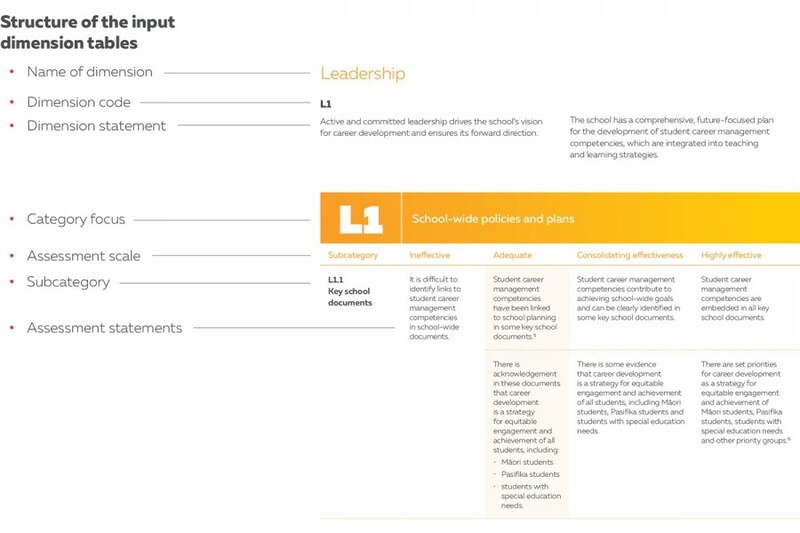 The adequate level is highlighted as this is the minimum level that we would expect schools to be performing at to achieve effective career development practice. Having different levels recognises varying degrees of achievement, and enables schools to identify their strengths and areas for improvement. Why do you have an "ineffective" assessment level? It is important to acknowledge where practice is not adequate. It will highlight areas of immediate concern and enable schools to develop a plan to ensure they are at least meeting the minimum requirements for effective career development practice. If you meet elements in the higher assessment levels, indicate these as this will enable you to clearly see what you need to do to reach the next level. Rate yourself at the level when you meet all the requirements. It is up to schools to determine and implement their development plan as a result of their self-review. If your self-review identifies areas that are ineffective in any subcategory, we would recommend these are the areas to prioritise in your action plan. Do schools have to use the benchmarks? No. The benchmarks are a self-review tool for schools to use. They provide a framework of what is required for effective career development practice in schools. They are designed to inform school practice, not prescribe it. However, schools are strongly encouraged to use the benchmarks. A consistent approach to career development across the sector will improve outcomes for our young people, and will also ensure alignment between career development provision at intermediate and secondary school levels, making for smoother transitions for students. The benchmarks are not intended to be an extra burden on key careers staff. They are a tool to be used to assist in developing programmes and services across the school, and should engage many more people than just the career staff. No. They are a self-review tool for a school’s career development provision, and are not designed to be used as a professional appraisal tool in the context of the career specialist’s role. They are not a set of professional standards – they describe requirements for successful programmes and services, not the role of the staff. Will the Education Review Office (ERO) use the benchmarks? Schools may choose to use the benchmarks as evidence of their practice and ongoing improvement when they are being reviewed by ERO. Schools that have completed a self-review and action plan and used them as evidence have reported positive feedback during ERO reviews. Why haven’t you specified the way schools should spend their targeted career funding? To do so would be contrary to the New Zealand system of school governance. The benchmarks indicate that good practice is to have open and transparent discussion of resource allocation, and that those decisions must reflect the needs of students. We will continue to support schools through professional development sessions, and will provide assistance for selected schools to do a self-review as part of our in-depth support service. We will not conduct the review for schools, but we will work alongside you to use the benchmarks, develop an action plan and improve your career development practice. Are you interested in sharing examples of effective practice in your school? We are looking for specific examples linked directly to the benchmarks so schools can learn from each other about the different ways of developing practice. To share your story or give feedback, please email us at careers@careers.govt.nz.